This Instant Pot French dip bowl is a simple dinner with tender chuck roast, savory au jus, creamy mashed potatoes, and a delicious horseradish sauce! It’s so easy and comforting. The Instant Pot allows you to get slow cooked flavor and falling apart pot roast in just about an hour! Slow cooker eggnog French toast is the perfect recipe to use up eggnog that’s on the brink (not that I know what THAT is) and BONUS: 10 minute prep time and it cooks overnight! It is SO easy and everyone in your family will love it. Use milk if your family doesn’t like eggnog! Delicious year-round, but PERFECT for Christmas breakfast! When I was a kid my dad taught me about the glorious beverage that is eggnog, and I was lucky to marry a man who shares my feelings about it. Languishing eggnog is not much of a thing in our house. We throw it back in servings much larger than what is recommended on the side of the carton. NO JUDGMENT PLEASE. We only get eggnog two months out of the year so we make the most of it! But it does happen, and when it does, you’re gonna need some eggnog recipes. Eggnog French toast is a perfect solution. Not that you can’t buy eggnog for the sole purpose of making eggnog French toast, because that is a 100% legit reason for buying eggnog. Though I hope you will drink some of it too, because eggnog. 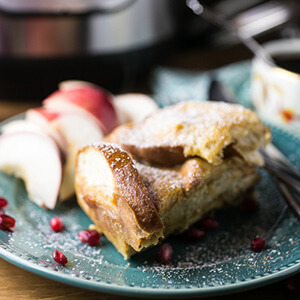 Making eggnog French toast in the slow cooker is the perfect way to have breakfast waiting for you when you get up. I mean, you could totally make it as a baked casserole (just sub eggnog for milk in this recipe), but sometimes when you wake up you need to get some carby goodness into your stomach ASAP, and slow cooker eggnog French toast is the ticket to a no-wait breakfast. French Toast for Christmas Breakfast Without the Fuss! Could you totally do this for Christmas breakfast? Heck yeah you could. Like, eggnog French toast is the perfect Christmas breakfast. And you probably should, because people will love you for it. I mean, those people probably love you already, but they’ll be like, “Heck yeah, eggnog French toast.” Well, that’s what I said when I ate this for breakfast this morning. Whatever you do, don’t skip the lining your slow cooker with foil and spraying it with cooking spray step. The custard will burn on and will ruin your slow cooker. Ask me how I know (sorry, old wound, still hasn’t healed). But you’re going to do the aluminum foil and spray step, so don’t worry. Just make eggnog French toast in your slow cooker! Tear off a long piece of aluminum foil and fold it in half lengthwise. Use this folded sheet of foil to make a "collar" to line your slow cooker. Tear off another long piece of foil, fold it in half lengthwise, and cut down the fold. 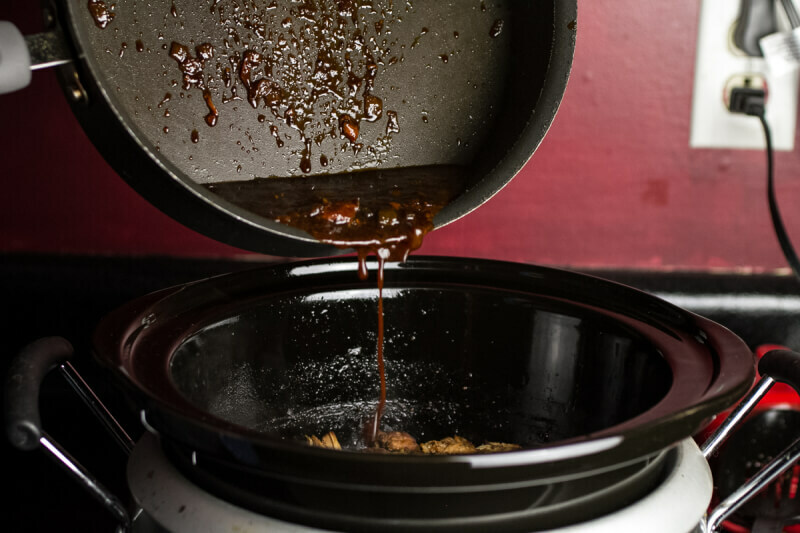 Lay one piece of foil across the slow cooker in one direction and press down into the cooker, then repeat with the other piece in the other direction. The inside of your slow cooker should be completely lined with the foil collar and "sling". Spray generously with nonstick cooking spray. Arrange the sliced bread in layers in the stoneware. I placed 3 slices of bread in each layer, slightly overlapping, and placed a piece down each side to fill in the gaps on the sides. Whisk the eggs, eggnog, and nutmeg together and pour over the top of the bread. My bread slices kind of "floated" above the custard so I pressed them down to soak it up. I just used my hands but if that makes you squeamish just use a spatula. Cook on low for 8 hours. If there is any liquid left, you will want to uncover the French toast for the last 20 or 30 minutes. Cut into wedges and serve with maple syrup, powdered sugar, and more nutmeg, if desired. If you’re a little unsure of exactly what to do with your Instant Pot, I’ve got ten Instant Pot tips and tricks to get you started! I bought my Instant Pot a couple of years ago…actually, it was a Christmas gift, but it was one of those deals where my mom had asked me what I wanted for Christmas and when I saw that the Instant Pot was a lightning deal on Black Friday I called her and said, “How much were you planning to spend on my Christmas present?” By Monday I had a shiny new Instant Pot in my kitchen. The problem with it was that I wasn’t sure where to start, and I’m not going to lie, it took me a while to feel comfortable with it. Pressure cookers don’t really have the greatest reputation as a safe cooking tool, so Philip just kept thinking that it was going to explode. I, on the other hand, couldn’t think of anything except my grandmother’s medieval era pressure cooker with a rocker that made so much noise. The first few things I made in my Instant Pot were slow cooked. In fact, it probably took me a couple of months to get up the gumption to put the IP under pressure. Once I did, though, I didn’t look back. I will slow cook occasionally, but it’s very rare. Now, I am obsessed with my Instant Pot as a pressure cooker. Hopefully, these my Instant Pot tips and tricks will help you get obsessed with YOUR Instant Pot too! 10. 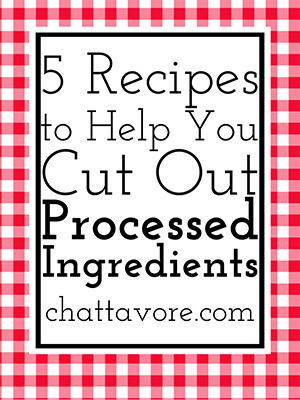 Anything you can make in your slow cooker, you can make in your Instant Pot too! Serious Eats said it first, but I’ll say it again: anything your slow cooker can do, your Instant Pot can do better! Now…I’m not trying to knock slow cookers…they have their place, for sure, and if you are someone who functions better in the morning and you need to come home to dinner that’s ready to go, then I can see why you are in love with your slow cooker. Me, on the other hand…I bristle at the thought of having to load up a slow cooker before I leave for work in the morning, but I’m happy to come home and throw some things in the Instant Pot while I make my lunch for the next day, grind coffee, check social media, and write some blog posts. My biggest complaint about my slow cooker was that, even with the ones that switched to “warm” when they were done cooking, certain foods (hello, chicken) would overcook. This is never a problem with my Instant Pot because I switch it off the second it beeps. So…I get the same super-tender foods that I get in a slow cooker with none of the morning rush or fear of overcooking. Roasts, soups, stews, chilis…yes, of course. But also, rice dishes, pasta, sides (Instant Pot mashed potatoes are one of my new favorites), and even desserts. The Instant Pot does it all. 9. Be sure to factor in time to pressurize and depressurize. In the reviews I have read that were not in favor of the Instant Pot, this was one of the biggest complaints. With a slow cooker, you basically set it, forget it, and come home to a pot full of food that probably doesn’t need much done to it – maybe a slice, a shred, or a garnish. With the Instant Pot, you’re going to be waiting on it a while. I know that if I put something under pressure, it’s going to take 15-20 minutes to come to pressure, then I have to factor in the cook time, then if it’s a recipe that needs to depressurize naturally, that’s another 15-20 minutes. Okay, it might take an hour or more for your Instant Pot dinner to be done…but like I pointed out in #10, you aren’t babysitting the Instant Pot. Make a side dish. Help the kids with their homework. Drink a glass of wine in the bathtub. The world is your oyster. 8. Skip the presets and use the manual buttons. Okay, so there are exceptions to every rule, and I do let the Instant Pot do the work for me from time to time (mainly when I’m cooking white rice) but for the most part, I use the manual setting. There is not one time for “meat” or “chili”…it just depends on what you are making and how much. I like to make my own rules. 7. Don’t use the rice setting for brown rice! Brown rice cooks much more slowly than white rice, and the “rice” setting is made for white rice! Don’t undercook your brown rice. Nobody wants that. 6. You can cook pasta right in the Instant Pot – no need for draining. A lot of my favorite recipes call for cooking the pasta right in the Instant Pot. It’s just like stovetop macaroni and cheese – you use way less liquid than you would typically think to use and the pasta soaks it up like a sponge. This is not only super easy, it also gives your pasta a ton of flavor. You need slightly more liquid than pasta, so if you are making 2 1/2 cups of pasta (about 4 servings), then you need 3 cups of liquid. And you only need to cook the pasta under pressure for about 5 minutes. If you use tomato sauce in your recipe (like my cheesy chili mac), you need even less liquid. 5. If you still want to do slow cooking in your Instant Pot, there’s a special slow cooker lid you can buy. And it costs less than $15, so I’d do it even if you don’t plan on using it all that often. When I first got my IP, I just found it to be a pretty gigantic pain to constantly have to unscrew the lid if I was checking on my food. I use the slow cooker lid when I’m using my Instant Pot just as a regular pot to cook (see #4) and I want to speed up the time it takes to heat up the contents. 4. You can use your Instant Pot to cook things instead of cooking on your stovetop. As in, you don’t have to use it as a slow cooker or a pressure cooker. Why would one do this, you might ask, when one has access to a stovetop? Well, for one, maybe you’ve run out of space on your stovetop. For example, it could be pretty useful on Thanksgiving. For me, though, this comes in most handy in the dead of summer when I don’t want to turn the ceiling fan off so I can cook something on my stovetop. I boiled pasta in my Instant Pot more times than I could count this past summer! 3. Sauté your food first for better flavor. I’ve used this trick for years when slow cooking foods…the caramelization that occurs on the outside of foods when you sauté them is flavor gold. It always annoyed me that I had to dirty another pan, though…so the Instant Pot is right up my alley. I just sauté my meats, onions, whatever, in the Instant Pot using the sauté function (I guess that was probably obvious) until it reaches the color I like, then I follow the remaining steps of my recipe. 2. The sealing ring gets stinky…but you can get the smell out. Honestly, it really doesn’t bother me all that much. It’s not like the smell gets in my food. A lot of people have told me that they can’t stand that about their Instant Pot, though, and it’s surprisingly easy to get the smell out. Some websites I’ve looked at say to just put it on the top rack of your dishwasher, but I am not really keen on putting a rubber gasket in the dishwasher. Instead, you can steam your sealing ring with a cup of white vinegar. If you have two sealing rings, you can do this right in your Instant Pot…but obviously, if you only have one, you won’t be able to do that (since you need the sealing ring to steam in the IP). Just do it for 3-5 minutes in a pot on your stovetop – and be sure to use a steamer basket so the ring doesn’t sit right in the hot liquid! 1. Cut large cuts of meat into smaller pieces before pressure cooking them in the Instant Pot. I cannot stress this enough. If you throw a whole roast in there, you will be sad because it will be tough and impossible to eat. If you cut that roast into 4-6 pieces, though, you’ll have a whole different story. If I buy bone-in roasts, I try to cut the meat away from the bone. Smaller cuts like chicken thighs and even certain steaks can be put in whole. These 10 things have helped the Instant Pot take its place as the number one cooking tool in my kitchen. What are your favorite Instant Pot tips and tricks? 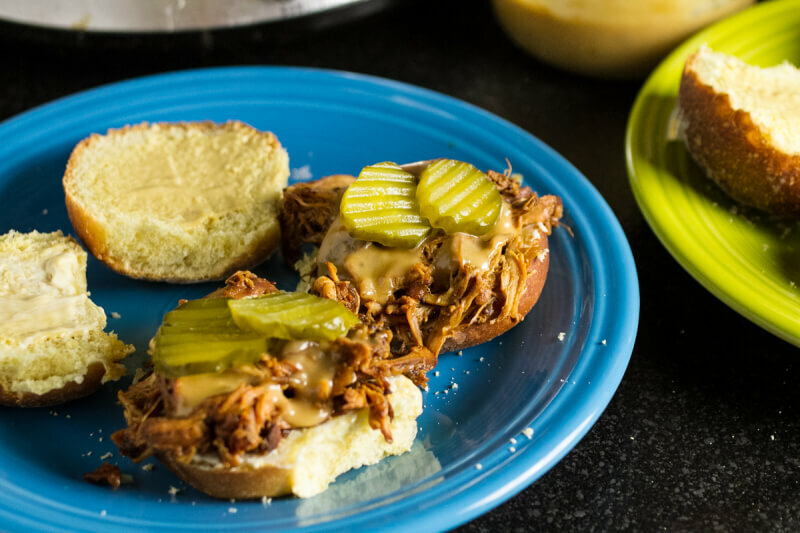 Slow cooker beer chicken is probably the best version of pulled chicken I could think of. It’s delicious on its own or piled on a sandwich (or fries)! This post may contain affiliate links. For more information, please see my disclosure statement. There is nothing quite as comforting as a slow cooker meal. Some require more steps than others…the best, at least as far as slow cooker simplicity goes, are the ones that require little more than dumping some ingredients into your stoneware before leaving for work. If, like me, you park in a garage, you are rewarded the second you open your car door by the scent of an already cooked dinner. It’s almost enough to make me want to cook something in my slow cooker every day, but that’s not going to happen. The truth is, I work better in the evening and if I had to make dinner every morning we’d eat a lot of take-out. For that reason, Sundays are a great slow cooker day for me. If I want something slow cooked for lunch, I’ll set the slow cooker to high; for dinner I’ll set it to low. Voilá…dinner’s ready. If I plan really well (and I usually do) I’ll have enough leftovers for at least one or maybe even two more meals. It’s some sort of magic, I’ll tell you. 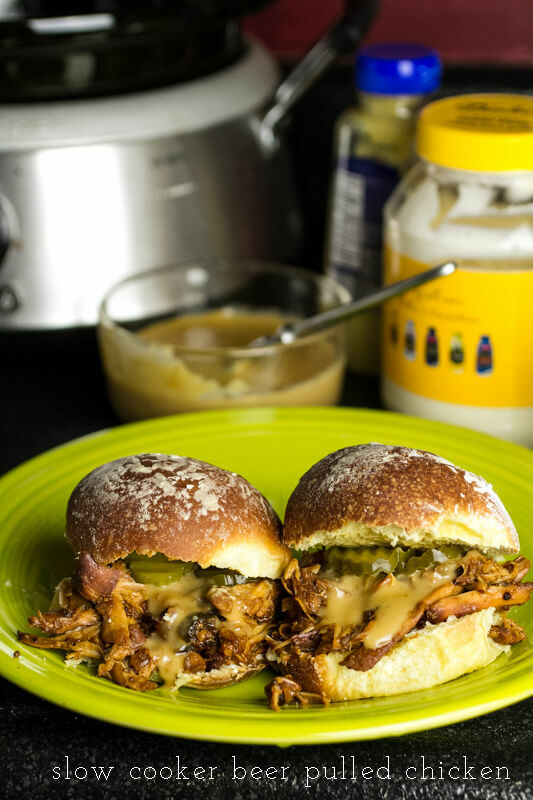 This slow cooker beer pulled chicken was born of a couple of different ideas….a jalapeño popper chicken sandwich and a different beer chicken recipe that I didn’t even reference when making this recipe but that was my original inspiration. I decided that I wanted the flavor of the beer to shine through-I don’t drink the stuff but I love the flavor it imparts to cooked foods-so I decided not to add anything that might make this more of a “barbecue” sort of dish. A little brown sugar took the edge off of the bitterness of the pale ale and smoked paprika and fresh onions and jalapeños added a flavor zing. 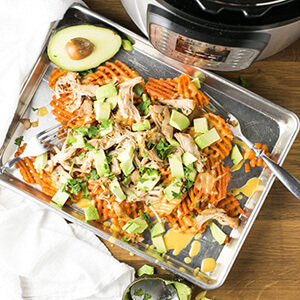 This slow cooker beer chicken was delicious piled on sweet potatoes fries and drizzled with beer cheese. Oh, and topped with avocado, of course. Leftovers will go in tacos or on baked potatoes. This chicken would be just as good eaten with a fork. And this dish came together in less than ten minutes. 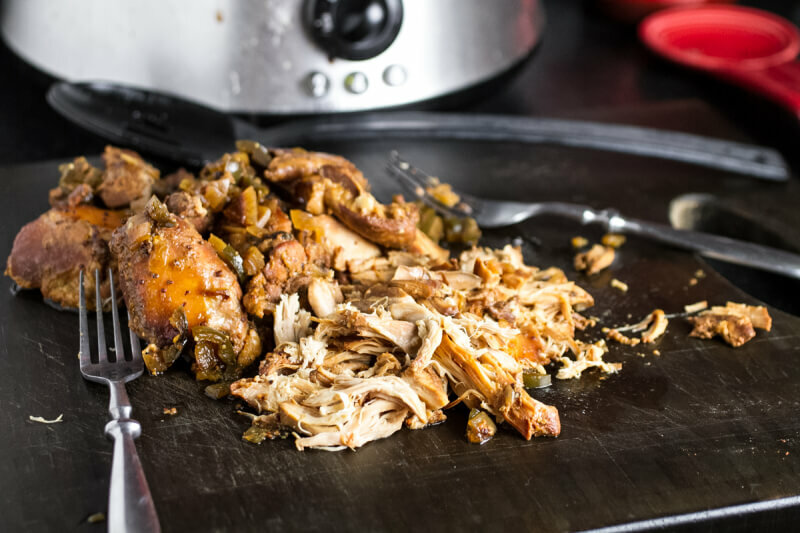 Why wouldn’t you make this slow cooker beer chicken? Place all ingredients into the slow cooker. Cook on high for 4 hours or low for 8 hours. Remove the chicken from the slow cooker. Pour the liquid into a large skillet and set over medium-high heat. Shred the chicken and return to the slow cooker. Cook the liquid over medium-high heat until it is reduced and thickened to a syrupy consistency. Pour over the shredded chicken and stir to combine. Serve while hot. Adapting this recipe for the Instant Pot is so easy! Just put all the ingredients in the Instant Pot and add the lid with the vent set to "sealing". Select Poultry and set time to 20 minutes. When the timer is up, quick release pressure then shred the chicken and serve! If you liked this post, be sure to subscribe to receive email updates! Follow me using the social media buttons at the top right, and share this post using the share buttons below! 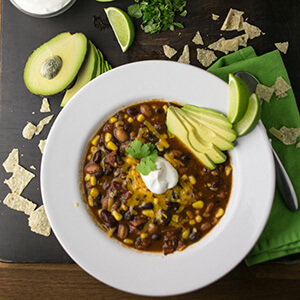 This vegetarian taco soup is healthy and delicious, and it’s easy to make in either your slow cooker or your Instant Pot! I got two slow-cookers (AKA Crock-Pots) when I got married. Actually, three people bought them for me but one of my husband’s friends saw the other two that we had already gotten in our apartment when he came in town for our wedding and took the one he had gotten us back (he subsequently replaced said slow-cooker gift with DVDs of Sixteen Candles and The Breakfast Club, much cooler gifts anyway, at least for these children of the eighties). It took me a few years to find my panache as a slow-cooker chef. I don’t really remember my mom using a slow-cooker when I was a kid and honestly I’m not even sure we had one back then (she does have a couple now). My early attempts at slow-cooker cooking included roasts (generally of the chuck variety), beef stew, chili, and taco soup from a recipe given to me by our school nurse (more on that in a minute). The first food blog that I ever followed with any sort of faithfulness was Stephanie O’Dea’s A Year of Slow Cooking, which I started reading after seeing Stephanie on The Rachael Ray Show discussing her pledge to use her slow cooker every day for a year. And blog about it. The good, the bad, and the ugly. That was in 2008 and she’s still adding new recipes, though not daily anymore. She’s also released two cookbooks: Make It Fast, Cook It Slow (which I own) and More Make It Fast, Cook It Slow (which I don’t own). Anyway, Stephanie made so many interesting things in her slow cooker….pasta, chicken nuggets, rice, brownies (okay, so none of those foods are particularly interesting….I really just meant that it was interesting that she made them in her slow cooker) and it inspired me to use mine more. Slow cooking is not fool proof, and you can’t just dump a bunch of ingredients into your slow cooker and be assured a delicious, perfectly cooked meal. Sometimes it happens like that, and sometimes your chicken has the texture of a paper bag (which is why I never cook chicken breasts in the slow cooker. I got burned, figuratively speaking, one too many times). Not all slow cooker meals take kindly to just being left for hours and hours and hours. Baked goods can burn, or you can forget to spray the stoneware when you make slow cooker French toast and then you have to trash your entire slow cooker because no matter how much you soak it the bread just won’t come off the side (not that it’s happened to anyone I know). Some meals, though, are magical. Like this taco soup. For many years I made taco soup that contained a whole lot of packaged stuff, and chances are if you’ve had taco soup it was probably pretty similar to what I’ve had. This one isn’t devoid of packaged foods…while I had pinto and black beans I’d cooked myself, the only kidney beans I had in the house were in a can, and it’s not tomato season (and even if it was I’m not sure I’d waste perfect seasonal tomatoes in a soup) so I used canned tomatoes. However, I didn’t see any need to add Ro*tel when I could cook a jalapeño instead, and I had all the spices in my pantry to make my own taco seasoning and ranch dressing mix…without the filler. Oh, and I doubled the beans and left out the meat. You could use half the beans and add a pound of cooked and drained ground beef….but I promise this is just as good (if not better). This soup is equally simple and delicious whether cooked in the slow cooker or Instant Pot. Instant Pot directions are included in the "notes" at the end of the recipe. Preheat the oil over medium heat in a medium pan. Sauté the onion and jalapeno until softened and the onion is translucent. Add the garlic and sauté for an additional 30 seconds. Add the chili powder, garlic powder, onion powder, dill, paprika, and cumin and cook for another 30 seconds. While the onion mixture is cooking, place the beans, canned tomatoes, and broth into a 4-6 quart slow-cooker. Add the onion mixture and stir to combine. Cook on high for 3 hours or low for 6 hours. Just before serving, add the corn kernels, parsley, and cilantro. Cover and heat through for 15 minutes. Add salt to taste. Serve with tortilla chips, grated cheese, sour cream, and more chopped cilantro if desired. To make this in the Instant Pot, preheat the Instant Pot on the saute setting. Follow the directions in step 1 then turn the Instant Pot off once the onions, jalapeno, and garlic are cooked through and the spices have been added. Add the remaining ingredients and stir to combine. Close the Instant Pot and make sure the vent is closed. Press the "Bean/Chili" button and set the timer for ten minutes. Once the cooking is complete, quick release the pressure and serve with desired toppings.